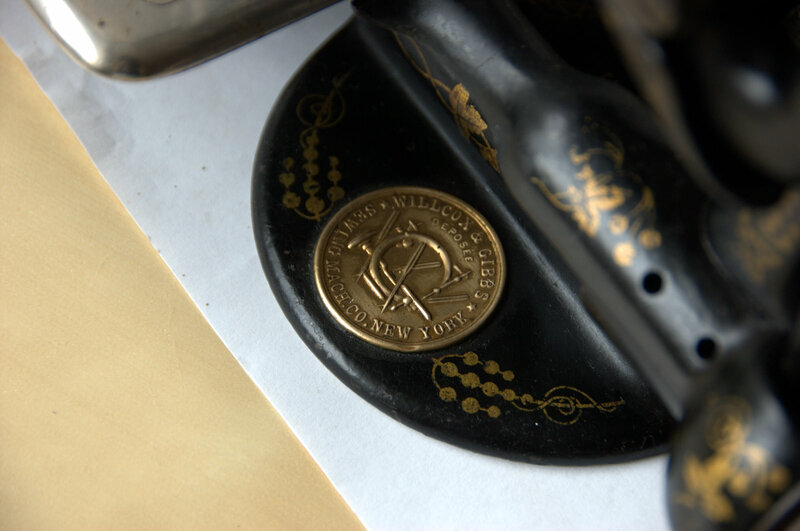 A turn of the century Wilcobb and Gibbs sewing machine! I believe it is made around the time of 1890. I love how it makes my brother sewing machine look like a giant in the background. Despite its petite size, it is heavier than my plastic brother, since it is made of pure metal. I am quite impressed by that most of its parts move smoothly. Though, I am disappointed that its feet doesn’t move up and down anymore due to a stuck spring — still troubleshooting that issue with the lady who sold it to me (she’s a serious collector, has over 80 old sewing machines!). Another interesting thing is that this does not have a bobbin! It just sews by one thread, instead of two. They call it a chain stitch and this technology is out competed quite early in the century. Mine actually still sews a stitch when I let the feet down and held it by hand. What a piece of beauty. 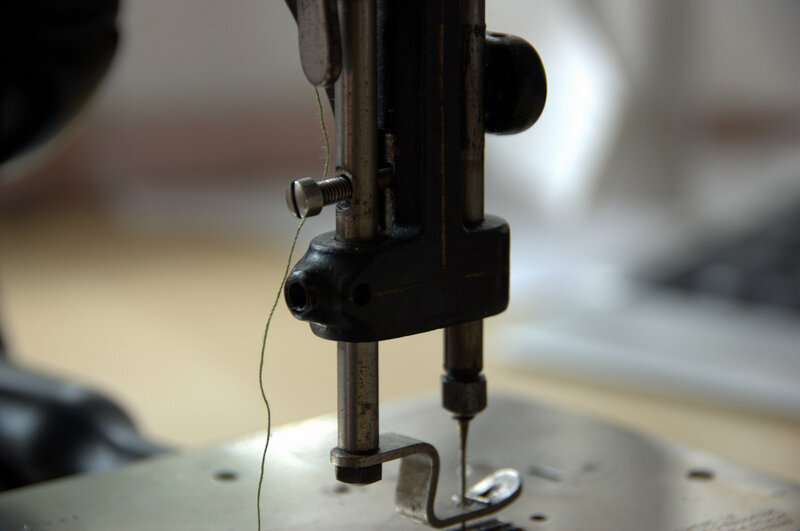 Just like hand made garments, it seems like old sewing machines are always well made with more pride and character. Even my husband, whom I imagined would roll his eyes in disapproval for buying a non-functional-and-yet-another sewing machine, declared that it is “wow, really cool”. I hope to fix the stuck spring on this pretty lady and clean it off a little more. And yes, my older Singer 201 is still sitting in my garage– I figured out that I need about 60 dollar worth of parts to fix it up and I am procrastinating on fixing it. Also, that thing weights a ton comparing to this little one and I have a hard time moving it about! This entry was posted on Wednesday, July 28th, 2010 at 6:20 pm	and posted in hardware. You can follow any responses to this entry through the RSS 2.0 feed. « Kasia 2.0 — Cuter and Better! Remember this moment, Jue. Cuz you might forget it in time. 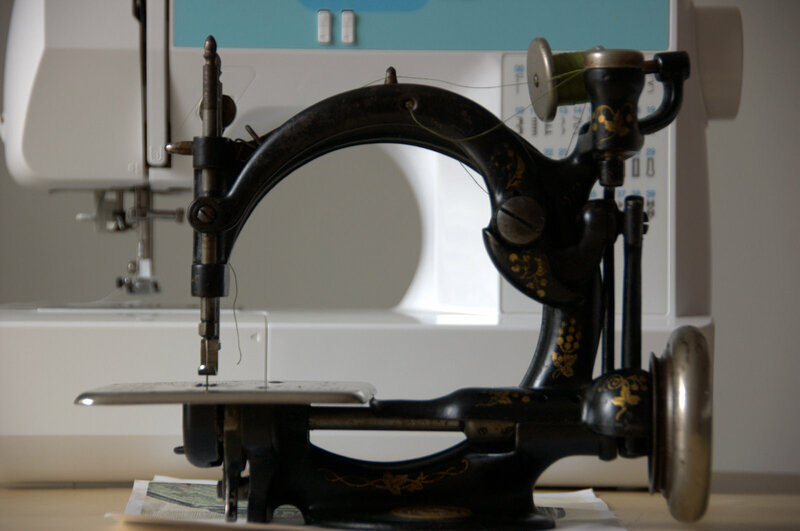 This moment, THIS, is the beginning of your sewing machine collection. It looks pretty cool, btw. If you ask Dan, he would go on and on about how things are so cheaply-made these days and nothing lasts more than its warranty period anymore, some even less. Petite sewing machine?!! Just in time for us to have some fun!!! It’s so gorgeous, I’m glad you got it! It looks so substantial and well made. I love the curved body…almost like a swan! Oh my goodness. That is such a beautiful machine! She’s so pretty! I love the design of vintage sewing machines. My mom had this behemoth of a sewing machine when I was kid that I loved to play with. It was a huge wooden table that the sewing machine had to be lifted out of, and had a big metal foot pedal at the bottom. I used to push the foot pedal as fast as it would go…I hope I didn’t break the thing! Sorry mom! What a pretty piece! I started sewing using my grandma’s Black manual Singer when I was in high school. It is a sturdy machine and it is still functional today. May I ask, what is craigslist? ?